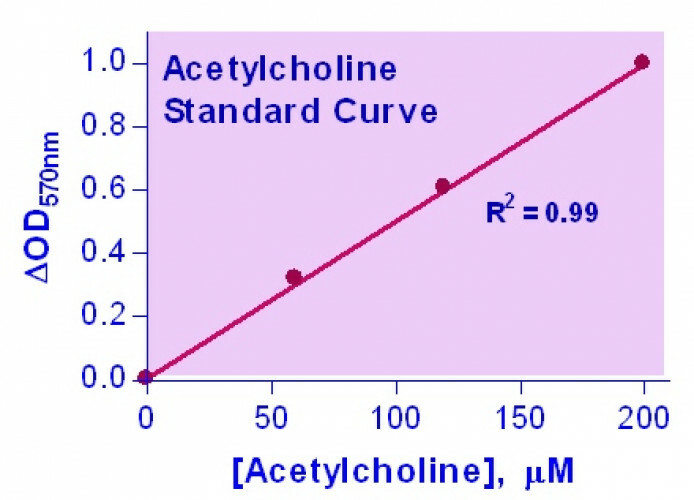 ACETYLCHOLINE is a neurotransmitter produced in acetylcholinergic neurons. It plays important roles in skeletal muscle movement, regulation of smooth and cardiac muscles, as well as in learning, memory and mood. BioAssay Systems’ method provides a simple, direct and high-throughput assay for measuring acetylcholine in biological samples. In this assay, acetylcholine is hydrolyzed by acetylcholinesterase to choline which is oxidized by choline oxidase to betaine and H2O2. The resulting H2O2 reacts with a specific dye to form a pink colored product. The color intensity at 570nm or fluorescence intensity (530/585 nm) is directly proportional to the acetylcholine concentration in the sample. Applications For quantitative determination of acetylcholine and evaluation of drug effects on acetylcholine metabolism. References Assay: Acetylcholine in Fish tissue (Pubmed).